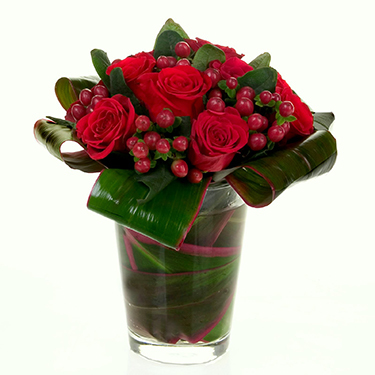 A Dozen Red Roses are presented with folded Ti-leaves and Red Hypericum Berries in a Flared Clear Cylinder for a contemporary approach to the classic Dozen Red Roses. Approximate size: 10 ½” h x 9 ½‘” w. Vase is 7”’ Tall (G47). For delivery within the Portland /Vancouver metro area. Our Designers can work with Florists elsewhere to replicate this arrangement.